The next event (The 30-Day Share Your Creativity Challenge) starts January 7, 2019. Are you a musician, writer, visual artist, actor, photographer, crafter, chef, designer, or some other type of maker or creative entrepreneur? Get Your ASK Out There! It’s great that you spend time creating music, words, art, and other expressions of your talents. It’s awesome that you post cool stuff on social media and spend time learning about marketing. 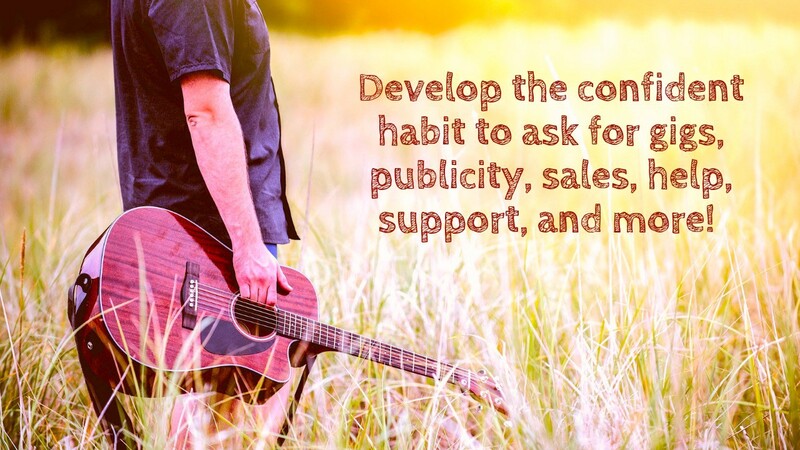 But the thing that will propel your career more than anything is to ASK for help, support, exposure, and sales! That’s why I’m launching the 30-Day Get Your ASK Out There Challenge! It’s a four-week experience designed to give you a creative community and a support system to help you develop the skills and confidence to ASK for the things you need as an artist. The challenge starts Monday, October 22, and ends Tuesday, November 20, 2018. What will you get out of the 30-Day Challenge? 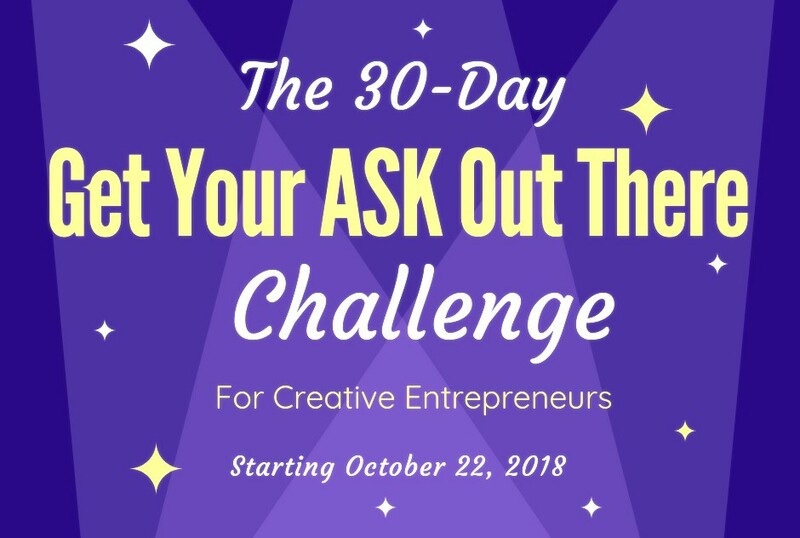 A Private 30-Day Challenge Facebook Group. You’ll benefit from the energy of a creative community. Everyone who signs up for the program will get exclusive access to this private Facebook group. That’s where most of the group energy and interaction will take place. Go there as often as you’d like and post updates on your ASKing progress. Get feedback, share your successes and struggles, ask for advice, and maybe even find other creative people to partner with on future projects. I will host five one-hour Zoom group conference calls on Wednesdays, starting October 24, at 1:00 PM Eastern (12:00 PM Central, 10:00 AM Pacific). During these weekly calls I’ll reinforce the ASKing theme of the week, answer questions, invite people to share their progress, and help you overcome challenges. These Zoom calls will be recorded so you can listen to them later. Week 4: Asking for the sale! Throughout the program I’ll post short video messages or broadcast live within the private Facebook group. In these sessions I’ll poke and prod you to keep taking action. I’ll give you my best advice on WHO to ask, HOW to ask, and WHAT to ask for. I’ll also answer your questions and cater to the specific needs of the group. In addition, you’ll get links to printable worksheets and checklists you can use to clarify your ASKing plan and record your progress. You’ll also have the option to team up with a 30-Day Challenge Success Partner. Hands down, this will be the most valuable aspect of the 30-day program, if you take advantage of it. You will have the option of being paired with another creative person also enrolled in the challenge. Think of them as an accountability partner and personal cheerleader. This Success Partner is someone you will connect with briefly about three times a week during the program. Knowing you will talk to someone adds a new level of commitment to being consistent. It’s also a great way to get advice and support from another artistic soul who understands you and is going through the same journey. The fee for this level is only $97 USD — one of the most affordable 30-day programs I’ve ever offered! If you take this option, you and I will have a private strategy session by phone or Skype for up to 60 minutes. Use this time to address whatever aspect of your creativity I can help you with most: marketing, productivity, branding, book publishing, juggling a lot of interests, etc. You can schedule this session at any time during the 30-day program or wait up to six months to use it. It’s up to you. I’ll give you access to any of my downloadable ebooks, audio programs, or online courses — up to $100.00 USD in value. Let’s do this — starting October 22, 2018. And let’s do it together! 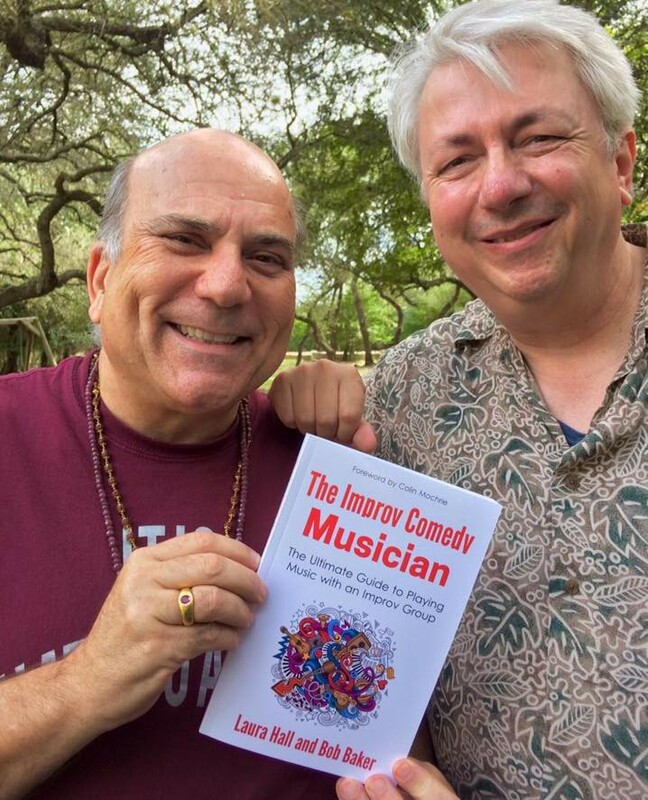 Bob Baker is on a lifelong mission to help musicians, authors and creative entrepreneurs use their talents and know-how to make a living and make a difference in the world. Bob with bestselling author Joe Vitale. Bob supplements his income with music (as a singer, songwriter, guitarist), visual art(as an acrylic painter), and improv comedy (as a teacher and performer). A prolific writer with dozens of books, ebooks, audio programs and online courses, he served six terms as president of the St. Louis Publishers Association and is an advocate for the self-publishing movement. CD Baby called him “The Godfather of Independent Music Marketing.” Bob is also an adjunct professor in the music department at Lindenwood University in St. Charles, MO. Bob’s other titles include The Empowered Artist, The Passion Principles, Unleash the Artist Within, The Guerrilla Guide to Book Marketing, Branding Yourself Online, The DIY Career Manifesto, and The Improv Comedy Musician(co-written with Laura Hall from Whose Line Is It Anyway?). I help musicians, authors and creative entrepreneurs use their talents and know-how to make a living and make a difference in the world! I also do art & improv.